It has been a rapid rise for Peter Fenner since he started up his business venture a little over 11 years ago, so maybe it’s fitting that he decided to dub his company ‘Fastrack Transport’ at the time. Irish Trucker caught up with the Kildare native recently to learn what they’ve been up to lately. Business has been good recently at Fastrack Transport Ltd and, as far as Managing Director Peter Fenner is concerned, the biggest headache nowadays is recruiting new drivers. It’s a problem that needs addressing on a national scale, according to Peter, who has grown his company from a single JCB to a fleet of 10 vehicles over the past decade or so. In that time, Peter’s son Conor has since come on board as a director of the business and things have been moving smoothly along the Fonthill Road in Dublin 22, as the company continues to grow. 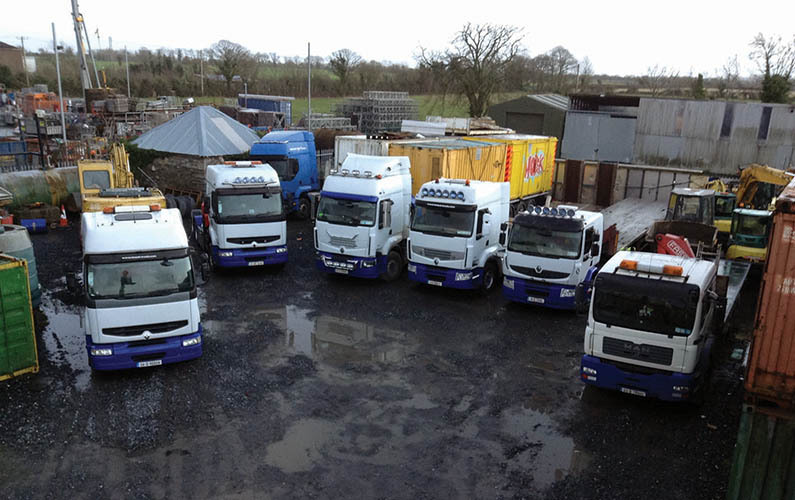 Further growth in the future will more than likely mean a requirement for more drivers but, for now, Peter is concentrating primarily on the present, as he explained to Irish Trucker recently. “We’re established since 2007 and right now we’ve 10 staff working here,” Peter outlined. “My son Conor is a director here as well. He specialises in the heavy-lifting end of the business and came on board with us seven years ago once he got his license. It’s a problem that Peter hopes gets solved sooner rather than later. However, he isn’t holding his breath on the issued being resolved. Instead the Dublin man is presently kept busy doing what he does best. What that is exactly he was good enough to take time from an increasingly busy schedule to explain. “We do a lot of low-loader work here both in and out of the UK,” said Peter. “We supply a lot of crane work for our clients and deliver glass, shuttering decks and scaffolding for them as well. Around 90 per cent of our work caters for the building industry. With the construction industry back booming in this country, Fastrack Transport have been one of the many firms to benefit and the plan is to make hay while the sun shines. When Peter first started out his venture in ‘07, the Irish building industry was right on the brink of being decimated by the economic downturn. Fastrack Transport turned towards other avenues to survive the recession and dually did. Now it’s benefiting from an upturn in its chosen industry, with its staff and vehicle count in double figures for the first time ever. It’s a far cry from when Peter first started out but, then again, he’s earned it, having practically grown up in the transportation game. “We’ve always been driving here – from Day One,” he stated. When I first started out 10 years ago it was with a JCB Fast Track and then I bought a tractor and a low-loader. Nonetheless, Fastrack Transport continues to provide a top class service to its clientele. The start to 2018 was a good one for the company and Peter is confident that they’ll continue to be busy right into next year despite somewhat of a blip this past February. “January was a good month for us here. We’d a good start to the New Year and February was not as hectic, but we’re just waiting on one or two jobs to come through at the moment,” said the MD. One invaluable trait which Peter feels separates the company from much of the opposition is that there’s no job which they aren’t willing to take on. The hard work has certainly paid off. Four years ago, Peter increased his fleet considerably and, thankfully, hasn’t had to look back since. When it comes to the brand that Peter buys, he won’t look past Renault for its value and quality. “Since 2014 we have bought five new trucks – all of them Renaults,” he stated plainly. “We choose Renault for a couple of good reasons I suppose. They’re cheap to buy, cheap to run, very economical and when you’re driving them it’s like you’re driving in an arm chair. They are very comfortable. While there won’t be any new trucks bought in 2018, it’s fair enough to say that Fastrack Transport will always stay on the lookout for a good driver.